So a British artist and a Canadian writer walk into a bar and get assigned the leftover superheroes on the American government's payroll. 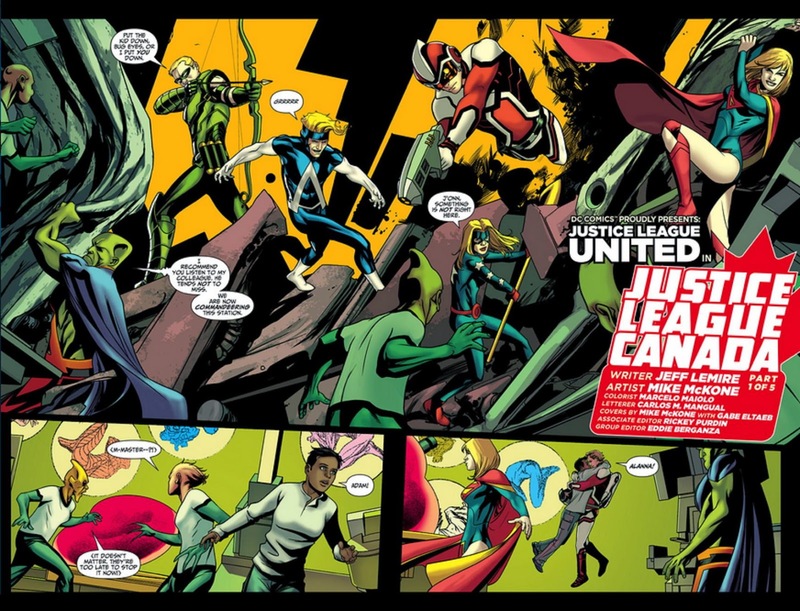 After a little shuffling about, Jeff Lemire and Mike McKone come up with Justice League Canada -- the first story arc of DC Comics new series, Justice League United -- published in April, 2014, in glorious, intergalactic, four color glory. To QUOTE Harry Chapin: 'So we talked all through that afternoon, talking about where we'd been. We talked of the tiny difference between ending and starting to begin'. We're in space. Specifically, the moon of Thalsalla, which -- unlike the forest moon of Endor -- is apparently the name of the moon, not the planet it revolves around. Then we've got four aliens clearly up to no good, when our heroes -- well, six of them, anyway -- bust in to do their hero thing. Three days earlier, though, and we're in Canada. Specifically, the South Building of the Toronto Convention Center, where people are lining up for a chance to meet Animal Man and Stargirl during a brief two hour window. But alas, some jerk named Adam Strange bogarts their time, and lures them into some action with his tale of woe and intrigue. Missing grad students! Alien skulls! Mysterious boxes! James Bay! Well hell! It's Jeff Lemire, isn't it? The man who saved Green Arrow from turning into 'Old Yeller'! Plus lets not forget who tortured Butter Baker Blondie Man for thirty whole issues. I honestly had high hopes for him, dear reader, and he surly met them, hands down. We jump right into the fray, then go back and apparently have to build the whole team up in just three days. We know the bad guys are up to no good, but we don't quite have all the details yet, or how our heroes are going to get there. Now if you aren't hooked on this opening story-line, then there's really no hope for you, pal. Mike McKone's artwork also has that “classic” superhero look, and surprises us periodically with his highly stylized panels. Plus we can always differentiate Oliver from the other men in the same scene, which is a refreshing perk as well. McKone's closeups are amazing, and his mid-range frames are a solid effort save for the occasional crucifix forehead. Although his long shots do suffer from the all too common artist problem of oversimplifying faces. For an introductory issue to a brand new series this one really covers a lot of ground. We get introduced to seven of our eight title characters, even though some of them are between five kilometres and 433.8 light years from the rest. Action scenes are additionally set to a minimum, yet there's tons of tension and intrigue building that you know it's going to pay off sooner or later. On top of that we've got an intergalactic big bad guy whose name just so happens to be the Welsh word for “Never”. And in my opinion this is a refreshingly “Darth Vader” flavored name in a universe filled with 'Sinestro', 'Darkseid', and other such silliness. I'm counting that as a third Star Wars reference. I've only got one significant complaint about this issue -- it's issue number zero. Originally, during 1994's 'Zero Hour' event, these were the “reborn” origins of characters after Parallax tried to rebuild the universe to his liking. As in 1994, the New 52 'zero issues' in September, 2012, interrupted the ongoing stories to give us origins in this new continuity. Even the three series that started with zero kept to this motif. Whereas JLU is very much the first issue of a five issue arc. It's issue one. Why are we calling it issue zero? Other bad things are really just nitpicky, which in itself is a good thing. In our world, Moose Factory Island is south of Moosonee, not vice versa as in the DCU. And Oliver Queen apparently can't use commas correctly in his speech bubbles either. Other than that, there are questions brought up that I'm hoping were intentional and will be addressed, but we'll cover those later. I'm sure some folks still have rage to vent about the “bounty hunter scum” we see towards the end, wanting to say he ruined this issue and blah blah blah blah blah. However, I'm more of a judge-it-by-the-story type of a guy. Right now they're two different characters who happen to share a name. As well as a certain Thanagarian apparently knowing this one from that one. Yes. It is a totally different north we're dealing with in this adventure. But with a bulk of the story taking place in unheard of daytime temperatures of -35.6°C, plus the remainder off it set in space, I'm setting the whole issue soundtrack to The Justified Ancients of Mu-Mu -- “It's Grim Up North”. We've seen what's coming later, but we're not there yet. 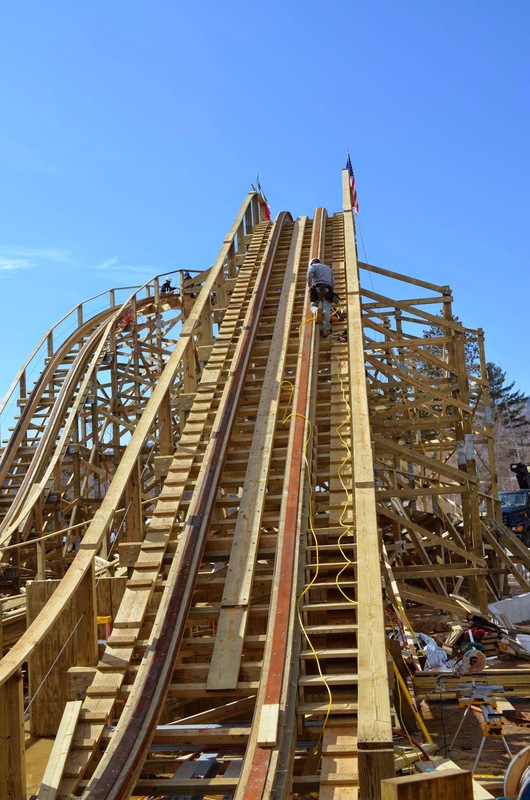 We're just looking up at the sky, hearts pounding, as the rapid click-clack of a roller coaster lift hill chain pull us up to the apex of what promises to be a thrill of a ride. This is one of those issues I finished and wanted to immediately flip to the next issue, only to realize I was reading a current publication. I need to wait. huh? 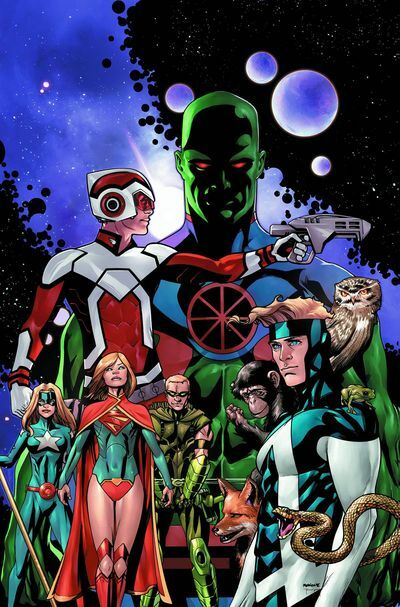 We still don't get to see how Justice League of America ends until the week after the next (“first”) issue of Justice League United, but frankly, I want answers before that. I may need to go to Toronto and stalk Jeff Lemire until he spills the beans. • Did neither Courtney nor Buddy notice Adam Strange's inconsistent claims of how much time has passed since Alanna's abduction? Are they going to say something? • Are we going to get any clarification on the ambiguity of how much time has passed since Forever Evil (referenced by J'onn) and why Buddy and Courtney are signing autographs while The Flash has everyone asking why he wasn't there to stop the Crime Syndicate? • Is Keewahtin the Cree word for Shazam? Is it an acronym? Is the Circle of Eternity involved in her powers? • If the JLA is disbanded, who payed for Ollie's airfare to rural Ontario? He needed that income to pay two staffers and keep the trick arrows stocked. • Did the Thanagarians notice Odym's destruction? Shouldn't there be a belt of debris orbiting Polaris to sort of throw the system in to chaos? • Is Buddy still with Ellen? Is Maxine okay? Is he really going to gallivant around space if they're expecting him home for dinner? • Doesn't Buddy have a pending intergalactic summons when the Bridgewalker passes away? • Wasn't... ah... he-who-shall-not-be-named en route to kill he-who-stole-he-who-shall-not-be-named's-identity? And stranded on Earth without a ship? How'd he get so distracted as to take a job on this moon?